Classic design men's wedding band, featuring a single 0.04 cts diamond burnished-set in the center of the satin finished ring bordered with yellow gold round polished edges. Handcrafted with 2.67 grams of 18k yellow gold and 5.42 grams of platinum, this style is also available for men to create a couple's wedding band set. For customization and other questions, contact info@rajjewels.com or speak to a LiveChat agent. 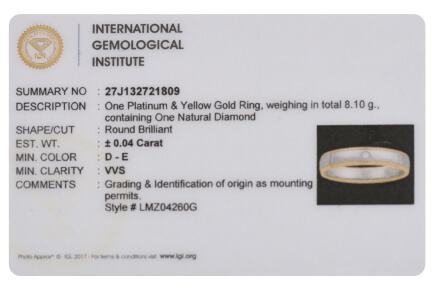 IGI Certificate and Mark of Platinum Assurance is available with the purchase. Need a size check? Refer to our size guide for assistance.